So it was appropriate that the more than 20,000 Catholic youths from across the country gave a bit more attention to the many priests and men and women religious who prayed with them, listened to inspiring presentations with them and had fun with them during the conference. Maybe God was using that interaction to call the youths to give prayerful reflection to a religious vocation. “Here we’re able to see their real personalities come out,” said Lillieyne Thompson of the Gary, Ind., Diocese. “They’re seen more as real people and not just as a holy figure. You see how they’re cool and do normal things like everyone else does. The priests and religious present at NCYC also represented more dioceses and religious communities than any of the young participants could know in their homes. Salesian Brother Damien Ho of Orange, N.J., agreed. “A lot of young people don’t recognize that they have a vocation or might not even want to know what it is unless they get exposed to different religious groups or missionary groups,” he said. “People here are willing to share about their vocations. The best way to get more vocations is to share about each other’s vocations. Other religious at NCYC shared the encouragement experienced by Brother Damien. 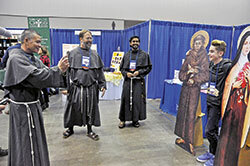 Conventual Franciscan Father John Bamman came to the conference from Mount St. Francis, where he serves as the vocations director for his order’s Our Lady of Consolation Province. He reflected on how the encouragement he gives youths at NCYC to consider a religious vocation often happens simply through being present to them during the conference. Seminarian Liam Hosty can speak to the effect that NCYC can have on young people trying to hear God’s call in their lives. He attended two of the conferences while a student at Roncalli High School in Indianapolis. At the time, he was thinking that God might be calling him to the priesthood, but he wasn’t sure about it. 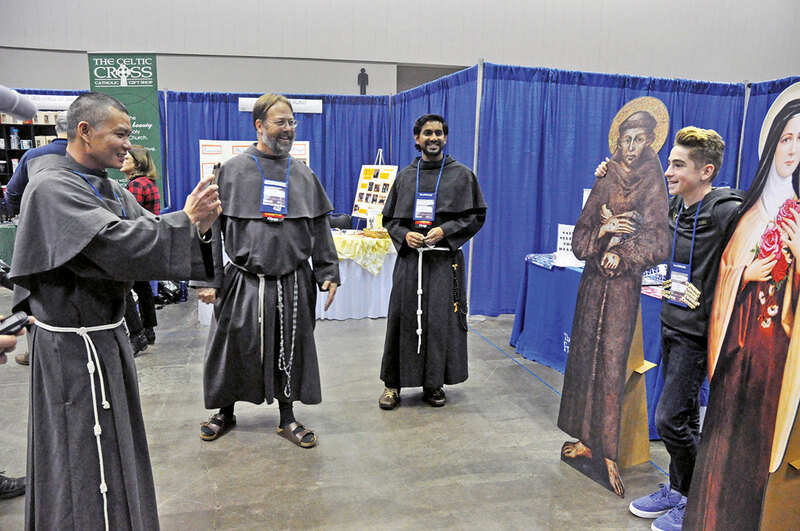 As a seminarian, he participated in his third straight NCYC, but this time as a volunteer, assisting at liturgies and in the room in the Indiana Convention Center where dozens of priests and bishops heard confession.